October 2, 2012 - There were no television cameras to record the top-secret flight, no flowers and champagne to greet the pilot. But his landing has changed the world and the way we live and travel. 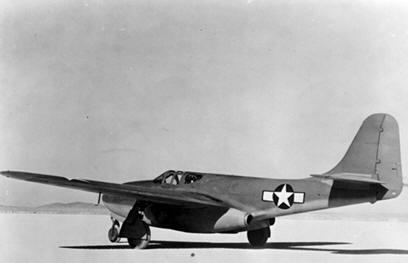 On October 2, 1942, test pilot Laurence C. “Bill” Craigie climbed into the cockpit of his experimental jet plane, the Bell XP-59A Airacomet, parked on the flat dry bed of Muroc Lake in California’s Mojave Desert. He briefly taxied on the dusty runway, roared a pair of I-A GE jet engines – the first jet engines made in America – and aimed the plane at the deep blue sky. “The flight itself was quite uneventful,” Craigie told the writer Steve Pace years later. “My clearest recollection of my flight in the XP-59A was the extreme quiet and complete lack of vibration as I took off.” It was the first official jet flight in U.S. history. Into the Great Wide Open, Bill Craigie took off in his XP-59A Airacomet from Muroc Lake 70 years ago. He climbed to 6,000 feet during the first official jet flight in U.S. history. The Airacomet was powered by two GE jet engines – the first jet engines made in America. A handful of GE engineers were on hand at the desert military base that day. Joseph Sorota, now 93 years old, is one of the last living veterans of the secret project to build the jet engines. “They called us the Hush-Hush Boys,” Sorota says. Much of the development work took place inside a wooden shack in the back lot of GE’s plant in Lynn, Massachusetts. In September 1941, Sorota’s team received a large package from England, under attack by Nazi Germany. Inside was one of the world’s first jet engines developed by British Royal Air Force officer Sir Frank Whittle. Because of GE’s extensive experience with turbo superchargers and steam turbines, the U.S. Air Force picked GE to improve on Whittle’s design. In just 10 months, the GE team had an engine ready for flight. Sorota was not at Lake Muroc when Craigie took off. He was back at Lynn, teaching mechanics how to fix the engine inside a public school, which the government commandeered for that purpose. With World War II still raging, the jet engine was the Pentagon’s secret weapon. The Bell P-59 Airacomet (P=Pursuit) was the first American jet fighter aircraft, designed and built during World War II. The United States Army Air Forces was not impressed by its performance and cancelled the contract when fewer than half of the aircraft ordered had been produced. Although no P-59s went into combat, it paved the way for another design generation of U.S. turbojet-powered aircraft and was the first turbojet fighter to have its turbojet engine and inlet nacelles integrated within the main fuselage.